Michael Ray specialises in using plant chemicals to help animals that have experienced severe trauma. WHILE most of us are spending the Christmas break surrounded by good food, company and with our feet up, one Sunshine Coast man is spreading some cheer to animals around the world. Noosa man Michael Ray is in the middle of a whirlwind sailing trip, stopping off at animal shelters along the way. Owner of Noosa Canine Pharmacognosy, Mr Ray specialises in helping dogs that have suffered severe trauma, neglect and separation anxiety. 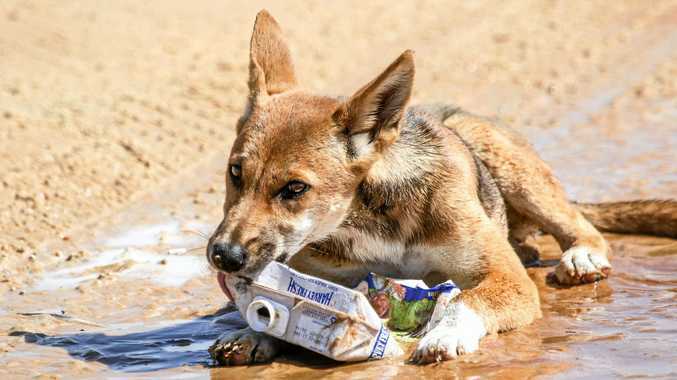 "Canine Pharmacognosy uses dogs' innate ability to detect the plant chemicals it needs to maintain good health, both emotionally and physically - just as their wild ancestors would have done before them," he said." "It is an amazing science that allows a dog to show us what they need. "It's connected to their highly developed sense of smell, and most of the time it is all done through inhaling the right plant extract that they indicate they need." Michael Ray is in the middle of an epic sailing adventure through the atlantic, stopping off at local dog shelters along the way to share his expertise. While he and companion Jay Grant sail from the Canary Islands back home to Mooloolaba, Mr Ray is lending his expertise to dog shelters across the Atlantic. "An important part of my journey is to visit dog shelters along the way," he said. "Working with animals in a caring capacity became a passion for me, and over the years I've struggled with the frustration of not being able to do such work full time." Len Jones, Jay Grant and Michael Ray docked at Vilamoura, Portugal. While the pair were docked at Vilamoura, Portugal, for six weeks, Mr Ray worked with a local animal shelter and practised solo sailing. 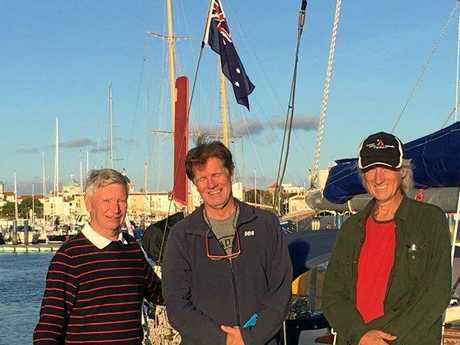 Australian traveller Len Jones was holidaying in Vilamoura when he saw the 34ft yacht tied at the dock, flag flying. A familiar sense of home many Aussie travellers experience, the men introduced themselves and and spent an afternoon sharing stories on the boat. You can track the Sagarmatha's journey in the link below. A new sailor, Mr Ray was inspired by Sunshine Coast's Jessica Watson and her trip around the world when she was 16 years old. 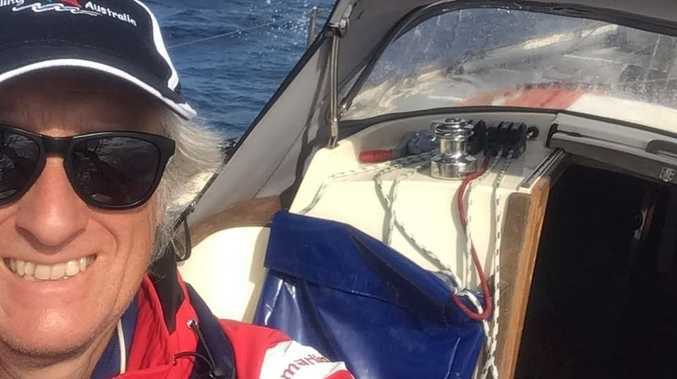 "I couldn't see why it wouldn't be possible for me to start sailing at the age of 63," he said. He trained with Sunshine Sailing School and joined the Sunshine Coast Yachting Club, and two years later sold his house to buy a boat. 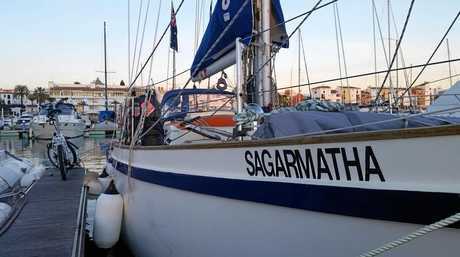 Finding the perfect Tradewind 35 in the Canaries, the "Sagarmatha", his adventure began. With hundreds of miles to his next stop at Antigua, Mr Ray spent a one-of-a-kind Christmas at sea. He's expected to arrive on December 30. "I've got Christmas cake, Christmas pudding and crackers on board!" For anyone wanting to follow Mr Ray's journey, click here.